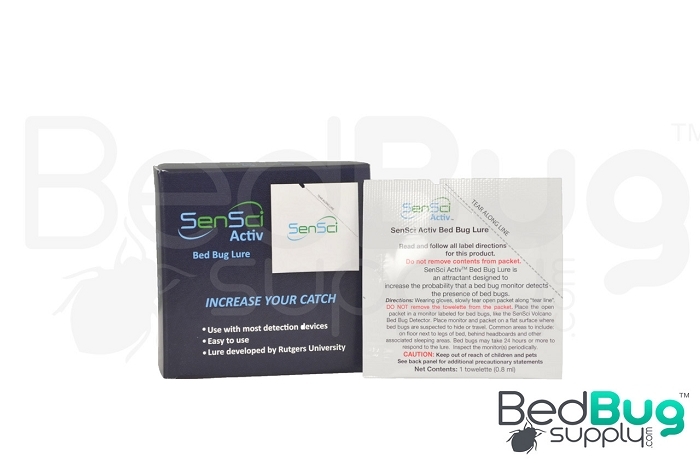 Developed at Rutgers University, SenSci Activ is a new bed bug lure designed to increase the effectiveness of a trap or monitoring device by slowly releasing an odor that attracts bed bugs for 2-3 months. SenSci Activ is sold in boxes of 12 lures each. 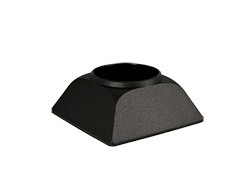 SenSci Activ offers homeowners and professionals a way to convert their passive bed bug monitor or traps into active devices, increasing their effectiveness at attracting and capturing bed bugs. The lure works by slowly releasing an odor that mimics the chemicals found on the surface of our skin, one of the signals that bed bugs use to orient themselves towards a meal. 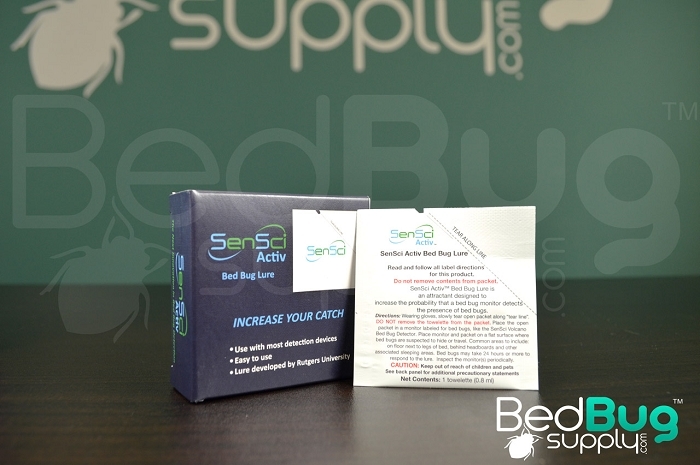 Bed bugs will begin sensing the lure within the first 24 hours of application, and you may use the same lure for around 2-3 months. Before opening a SenSci Activ lure, be sure to read and follow the product's label for safe and effective usage. To install, slowly tear off the designated corner of the packet, releasing the odor coming from the moist towelette that’s located inside. Do not remove the towelette from it's packaging or expose more than the instructions permit. Overexposing the towelette will lead to a shortened effective window. Once you have an open lure in hand, place it inside your monitor (or intercepting) device and strategically place them on paths you believe bed bugs are using to reach you. Jeff White, the technical director of BedBug Central and host of BedBug TV, has more than 10 years of experience working with bed bug biology and behavior. Recently, Jeff has been conducting researching to find possible ways of improving bed bug monitoring strategies and bed bug monitor performance. Developed at Rutgers University, a agricultural testing facility that is renowned for its contribution to bed bug research, SenSci Activ slowly releases a bed bug-attracting odor that can significantly increases the effectiveness of your passive bed bug monitor or trap. 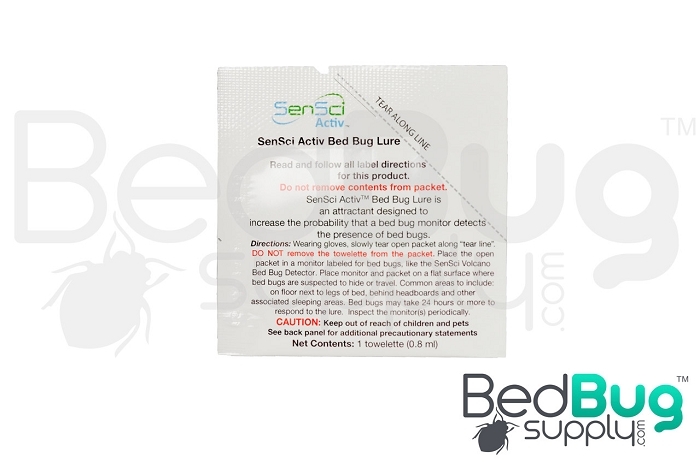 Q: is the sensci activ bed bug lure safe for humans ? what chemicals are used in this product ? do you need a sds sheet for this product? The Activ is perfectly safe for humans as long as the humans follow the included instructions. There are no insecticidal properties to the lure - it's just meant to attract bed bugs to a trap. You can find the MSDS with a list of ingredients here. Q: After you lure bugs what is best way to kill them while inside volcano intercepter? I don’t want to interfere with lure either by spraying something? Please advise? You could just smush them with a paper towel corner and/or flush them down the drain. They can't climb back up the pipes even if they survive.